Piano teachers everywhere have students in their studio with complex needs. Be it visual impairment, Autism, ADHD, Dyslexia… the spectrum of differences is wide. And piano teachers everywhere have questions about how to effectively meet the needs of these students. 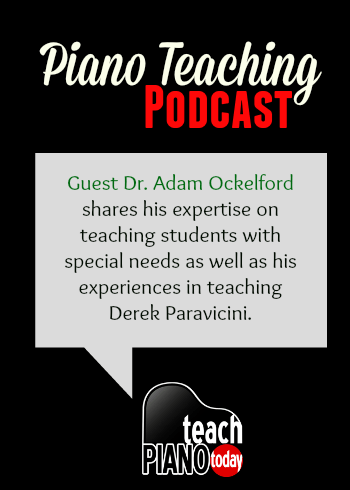 In today’s Teach Piano Today podcast, we’re interviewing Dr. Adam Ockelford on the topic of teaching students with special needs. Dr. Ockelford has spent his career working with children with complex needs and the success he has created is astounding. You may recognize Dr. Ockelford’s name as being the teacher of Derek Paravicini; a concert pianist who is blind and who has severe autism. Derek now tours the world with a busy performance schedule; recently performing for royalty at St. Paul’s Cathedral in London. Why music education, in particular, is so important for children with special needs. The Sounds of Intent project and how can it assist music teachers and therapists. The struggles he faced in the early days of teaching Derek and how he overcame them. Finding a balance between focusing on “good teaching” vs. focusing on the joy of music making. If you’re as fascinated as I was about the teaching relationship between Dr. Ockelford and Derek, be sure to check out the TEDtalk where the two demonstrate Derek’s profound abilities. You can learn more about the Sounds of Intent project discussed in the podcast at www.soundsofintent.org. Click the player below to listen to today’s podcast or visit our iTunes page to download it to your iPod or smart phone and take us “on-the-go”.